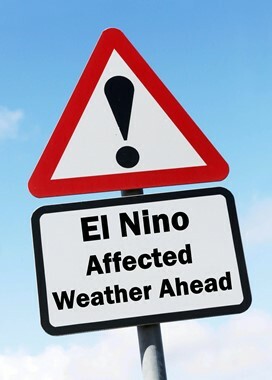 El Nino conditions in the south usually result in high rainfall and flooding. During what is a 'dry period' in a normal year, record rainfall, flooding, and discharges from the Caloosahatchee and Lake Okeechobee were observed to cause decreases in salinities and algae blooms in the lower estuary. Salinities in the lower estuary are usually between 28-32 during the dry period (November-May) and between 25-30 during the wet period. In the first half of most years, salinity is high and not variable (Figure 1 below). During the wet period, rainfall and flow can cause salinity to decrease and be more variable because rainfall doesn't always occur on the same day(s) every year. The colored charts show the 'normal' values for salinities as red and orange, and more rare values as blue and green. The black line shows 2016 salinities in the J.N. "Ding" Darling National Wildlife Refuge and McIntyre Creek. Studies have shown that decreases in salinity at McIntyre Creek are driven by discharges from S79, a combination of watershed flow and flood control flows from Lake Okeechobee. The 2016 values were well below normal and had effects on seatrout growth (Bortone et al. ) and seagrass leaf growth (Milbrandt and Siwicke 2016). Figure 1. Salinity percentile distribution plot for all years since 2010 (USGS Data 2010-2013, RECON 2014-2015) at McIntyre Creek in the Ding Darling National Wildlife Refuge. The black line is the 2016 salinity values and the hot colors are normal values.The area of the background that is white represents where no previous readings have occurred. 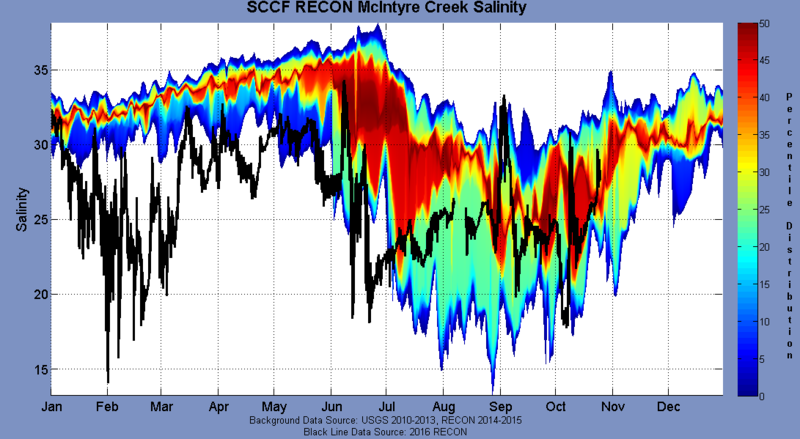 During the winter of 2016 the salinity at McIntyre Creek was lower than had ever been recorded for that time of year, with levels approaching summertime rainy season lows. The two spikes in chlorophyll a in the Ding Darling National Wildlife Refuge correspond with the two pulses of discharge from S79. The high flows and freshwater containing runoff and other limiting nutrients caused two periods of high algae biomass (also known as a bloom) in the lower estuary and in the Refuge.